Philip and Aurora are shocked when they see that we have returned. Aurora tells us that the kingdom has been restored. Charming and I argue over the rightful ownership of the castle. Snow chimes in that we should all go together and show unity. Once we are out of sight Aurora looks panicked. She tells Philip that they must notify ‘her.’ She is frightened for her unborn child. The dwarfs are happy to be home. Jiminy Cricket sits upon Grumpy’s shoulder and gives him a message. Grumpy finds Charming and tells him that Jiminy Cricket said that 52 other Storybrooke residents have been returned as well. Charming tells him to spread the word to head to the Queen’s castle. Charming notices that Hook is packing to leave. He asks where he is going. Snow joins them. Snow and Charming are disappointed to hear that Hook wants to resume life as a pirate. They warn him he may not find his ship but he wants to go anyway. Baelfire then joins them and tells them he wants to go to Rumpelstiltskin’s castle to find a way to find Emma. 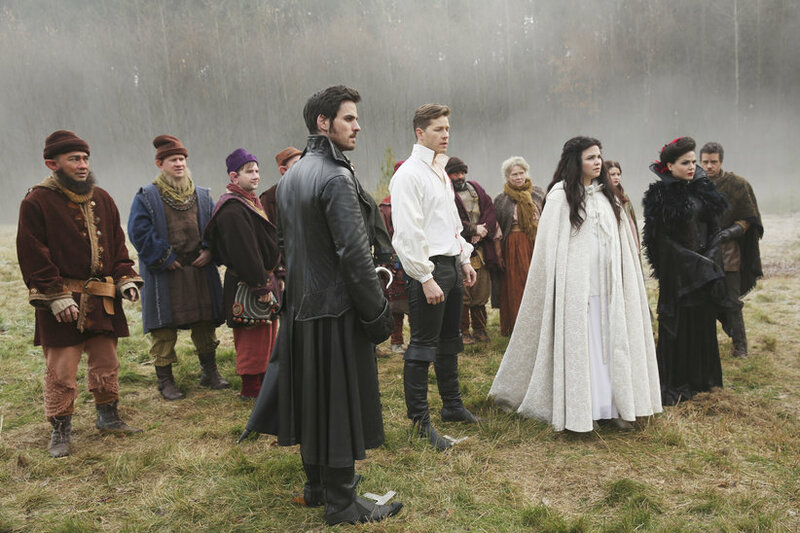 Snow and Charming tell him that he must let go and move on. Belle walks alongside Bae and tells him that he will find a way to see Emma and that she believes that they can bring Rumple back. Grumpy tells Snow that I am missing. She finds me by myself burying my heart. She tells me that this is not right. I tell her I need to do this because I had to give up Henry. She reminds me she also gave up her daughter. She encourages me to take back my heart so that one day I may find happiness as Henry would have wanted that for me. I take back my heart and we are ambushed by some flying creature. I hit the creature that looks like a flying monkey with a fireball. It is able to grab me. Snow pulls me down. Suddenly the creature is shot down by an arrow. Robin Hood introduces himself and his Merry Men. Robin catches up with Bae and Belle. I ask Snow what she thinks of Robin. She tells me that he is cute. Secretly I agree but tell her he smells like forest. We find the castle but something is not right. Someone has broken my protection spell and cast one of their own. I am furious and want to invade. Everyone tells me not yet. Robin tells us we have a place to go in the forest where we will all be safe. We agree to go. Emma meets a man for dinner at a very nice restaurant. The man’s name is Walsh and he is her boyfriend. He also speaks very fondly of Henry. Walsh leaves Emma to go to the restroom. Hook takes his place in his seat. He tells Emma he has proof that she is not who she thinks she is. He hands her a paper with an address. He tells her to go there and then meet him in Central Park. Walsh returns to the table. He proposes marriage during dessert. Emma does not look happy. She runs out of the restaurant. He apologizes and tells her they don’t have to marry right away. She tells him she needs some time to think about it. Emma returns home to Henry who is playing video games. He had an idea Walsh would propose and seems to approve. He tells Emma she should be happy and not think every man is like his father. The next morning he asks her about a permission slip for a field trip. Henry can see she is distracted but thinks it is over Walsh. After he leaves Emma goes to the address Hook gave her. She finds it is Neal’s apartment. She is confused when she finds Henry’s camera there. Emma meets Hook in the park. She wants answers about Neal’s apartment. He hands her a potion and tells her to drink it. Instead she handcuffs him and the police come. She tells them he is the man who has been harassing her. They arrest Hook as she walks off. Emma is with Henry walking home. He asks her what she will do about Walsh. He tells her he text Walsh to come over later and made his own arrangements to sleep at a friend’s house. Emma sends Henry upstairs and opens up an envelope. She is shocked at what she sees. Emma finds Hook being released and tells him the pictures on the camera were of her and Henry in a place called Storybrooke. He encourages her to drink the potion and break the spell. Emma softens up and tells him her life is great. He tells her it is all a lie. She drinks the potion and gets her memories back. Hook and Emma go to her home and catch up. He tells her he left everyone and that he received a message there was a new curse. This new curse sent everyone back to Storybrooke but nobody knows why. They are interrupted by the doorbell. Emma realizes Walsh must be there. She asks Hook to wait. Emma tells Walsh she cannot marry him. He becomes upset and Emma is alarmed when he tells her she should have never drank the potion. Walsh transforms into a flying monkey and tries to attack her. Emma is able to kill him. Hook hears the scuffle and comes outside. She tells him that they will leave in the morning. The next morning Emma tells Henry he does not need to go to school. She has a new case and he can come with her. The doorbell rings and she tells him this is the client. Henry does not recognize Hook. Emma returns to Storybrooke with Hook. She tells him she needs to see her parents. She heads to the apartment and David answers. He recognizes her. She is reunited with Mary and David. David tells her there is a curse that has caused them to come back but they cannot remember the past year. Mary reveals that she is pregnant. A flying monkey roams my castle that has been taken by a wretched green creature. The Wicked Witch is delighted that he has brought her some of my blood. She vows to use it for revenge and that wicked always wins….